This is a 19 year old African-American female who was referred by her rheumatologist for an eye exam as she had recently been put on Plaquenil 2 months ago. She had no major complaints, only that sometimes at night her vision is a little blurry. Her past medical history is significant for lupus, which was diagnosed recently on a hospital admission in June. She was found to have nephropathy from a renal biopsy, as well as pericarditis and pericardial effusion (which was drained). She also was found to be ASMA positive and had elevated LFT's, which were thought to be due to autoimmune hepatitis vs. congestion due to her pericardial effusion and right heart failure. She was recently started on Imuran as well as Plaquenil in order to help stabilize her disease. She is also on daily prednisone (50mg). Her past ocular history is unremarkable. She could not recall when her last eye exam was. 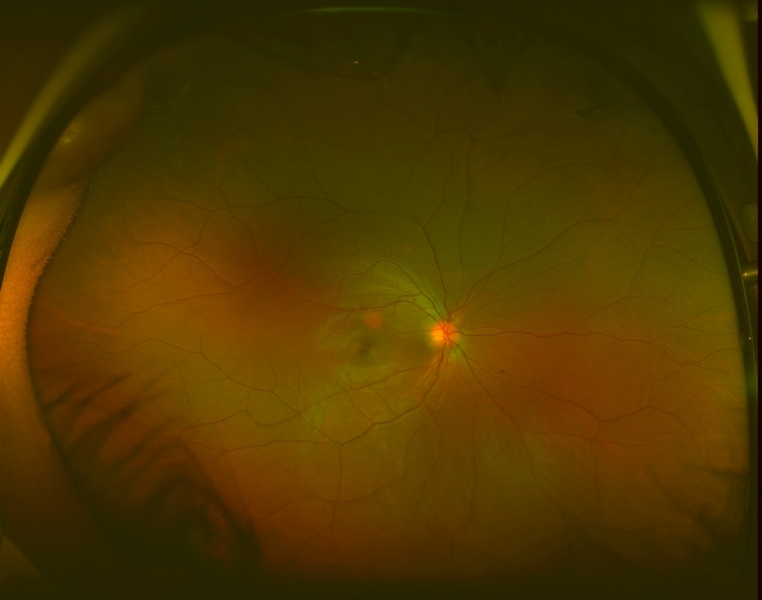 On exam, her visual acuity was 20/20 OD and 20/25 OS uncorrected. Intraocular pressures measured 16mmHg OU. Her external and anterior segment exam were unremarkable, with no evidence of inflammation. 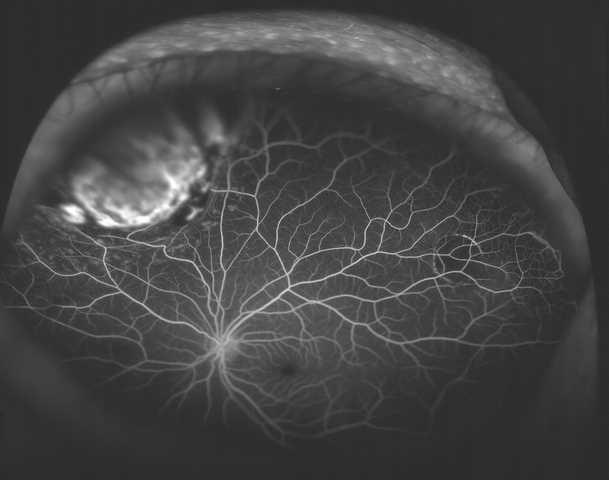 The posterior segment exam in the right eye was also unremarkable, with normal-appearing vitreous, optic nerve, macula, retinal vessels, and periphery. Examination of the left eye showed normal vitreous with no cells, normal optic nerve, and macula. In the supratemporal mid-periphery was a flat ~3 disc area CHRPE. 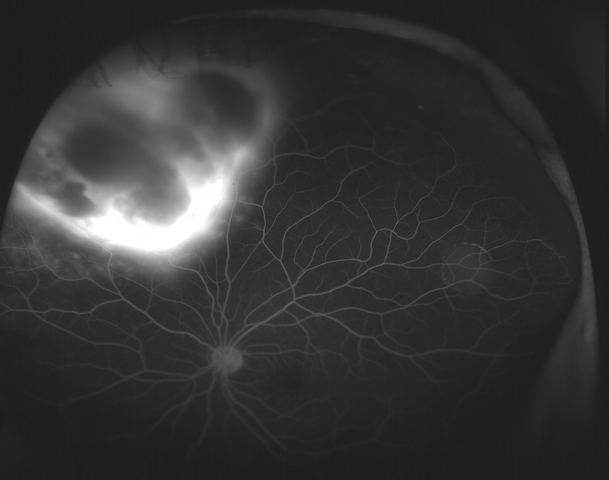 In the supranasal periphery there was an irregular, elevated choroidal mass which involved 2 clock hours, which did not appear to extend anterior to the pars plana. The posterior aspect is anterior to the equator. The lesion was pigmented and there was trace hemorrhage overlying it. 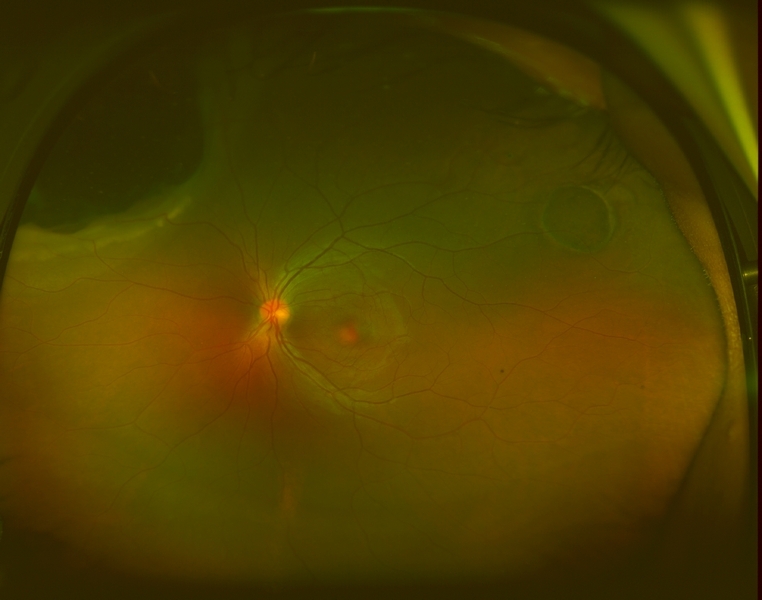 There was shallow subretinal fluid over the lesion and mild lipid exudation on its border. 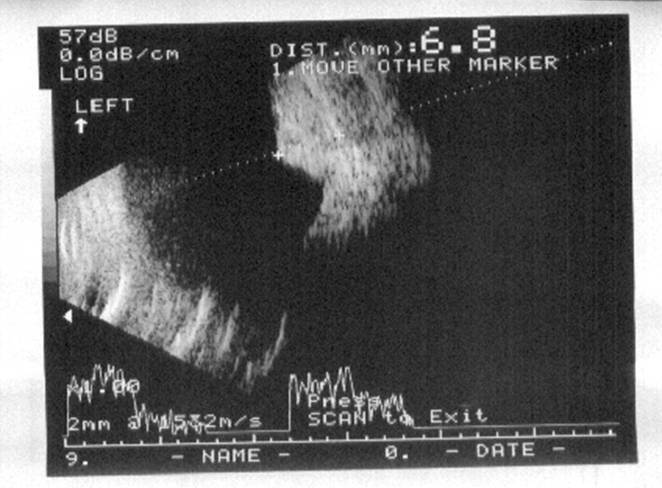 B-scan ultrasound shoed the lesion to be solid, with a height of 6.8mm and had low internal reflectivity. 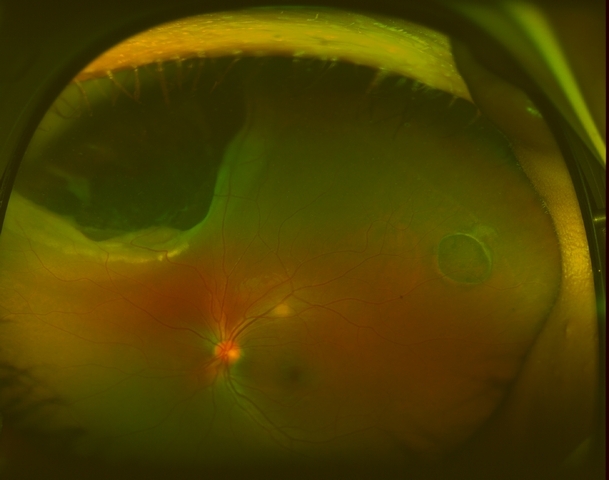 Optos fundus photographs and fluorescein angiogram were performed. 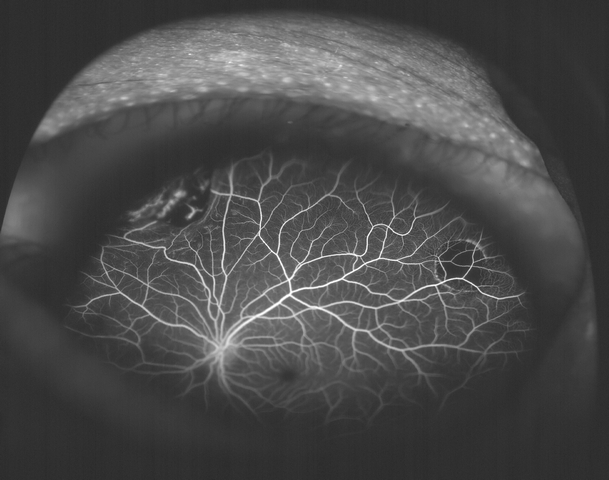 The angiogram showed early blockage with some mottled hyperfluorescence that increases in the later phase, with diffuse late leakage overlying the tumor. Further workup is in progress.